Family. Hard Work. Dedication. Strong Values. The Mandujano brothers and their siblings were raised with these principles at the center of focus. Mando, Tony and Beto Mandujano, in Coyanosa, Texas, have a diversified farm in West Texas that allows them to not only raise crops, but their families as well. Along with producing cotton, they raise cattle, own a restaurant/store, and grow onions, watermelon, cantaloupe, pumpkins, alfalfa, and hay. Their farming operation is deeply rooted in family values as the Mandujano brothers try to live by the foundation of morals and hard work created by their parents, Alvaro and Cecilia Mandujano. to do. In 1977, Alvaro moved his family to Coyanosa to take advantage of an opportunity to work for a farmer. Later, he had the chance to buy land of his own and begin building his business. In 1993, three of the 11 siblings formed a farming partnership, Mandujano Brothers, around the time they graduated from Angelo State University. They have since grown their operation into what it is today covering thousands of acres of land. Tony said without their parents they would not be where they are today. Mando agreed with his brother, Tony, and said their parents were very honest and tried to raise them right. The Mandujano brothers work well together. Each plays their own role in making sure every aspect of the operation runs smoothly. They have around 20 full-time employees and employ between 130-150 people during harvest depending on the year. 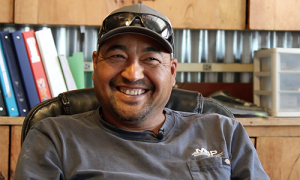 Mando said they not only enjoy working with family each day, but they also have a deep love for farming. Tony echoed Mando’s comments and said being happy is the most important thing. “Well you know, it is a lot of hard work, but there are a lot of rewards to it,” Tony said. “You get to make your own schedule and see the progress. A lot of times people look at it and say, ‘These poor guys, they are doing this and doing that,’ but everybody has to do something. As long as you are happy and enjoy what you are doing, and make a little profit, that is even better. Mando also said managing such a diversified farming operation requires extensive planning. Out of all the crops they grow, each brother has their favorite. Tony said he enjoys onions because they are only harvested once, while Mando said his favorite would have to be watermelon. There are ups and downs to farming, but Tony said to him being sustainable is making it through each and coming out on the other side. The Mandujano brothers are members of Coyanosa Co-op Gin and PCCA. Mando said cotton co-ops are valuable to their operation even though their cotton acres vary year to year. He said both co-ops help add value to their operation whenever possible. 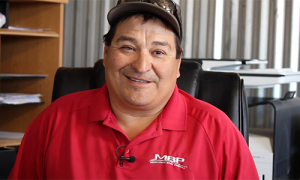 Mando said he enjoys having his family close and getting to farm with his brothers and parents each year. He also said he loves seeing his daughter grow up in agriculture. Surrounded by the fruits of their labor and the love of their family, for the Mandujano brothers the cantaloupes they grow aren’t the only thing that makes their life sweet.